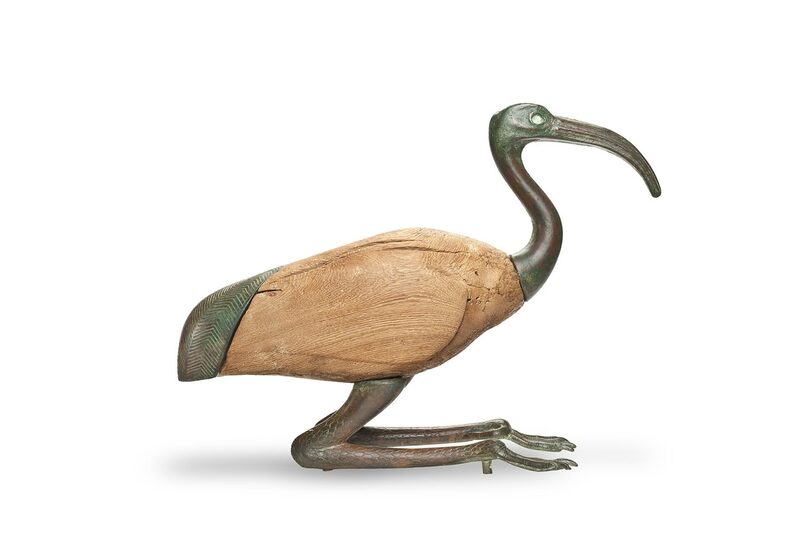 This magnificent bronze and wooden Ibis statue is from the early part of the 26th Dynasty of Ancient Egypt – the last native dynasty of rulers before the Persian conquests in 525 B.C. Also known as the Saite Period, it rose from the ashes of a decentralised state which has been ravaged by foreign occupation. Psmatik I, a member of a powerful family from Sais, seized control during a power vacuum and asserted his authority founding the dynasty. This dynasty, like many before it, sought to emulate the artistic styles of their predecessors in order to support their own claims of lineage. The ancient Egyptians pioneered the creation of what modern scholars term ‘multi-media’ works, which fuse several materials, in this case wood and bronze. 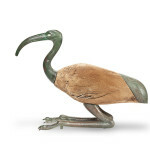 Sculpted from a single piece of wood, perhaps cedar, the body of the ibis exhibits beautiful contours with detailed incised lines to delineate the birds plumed wings, which are tucked tightly in to its torso as it perches. 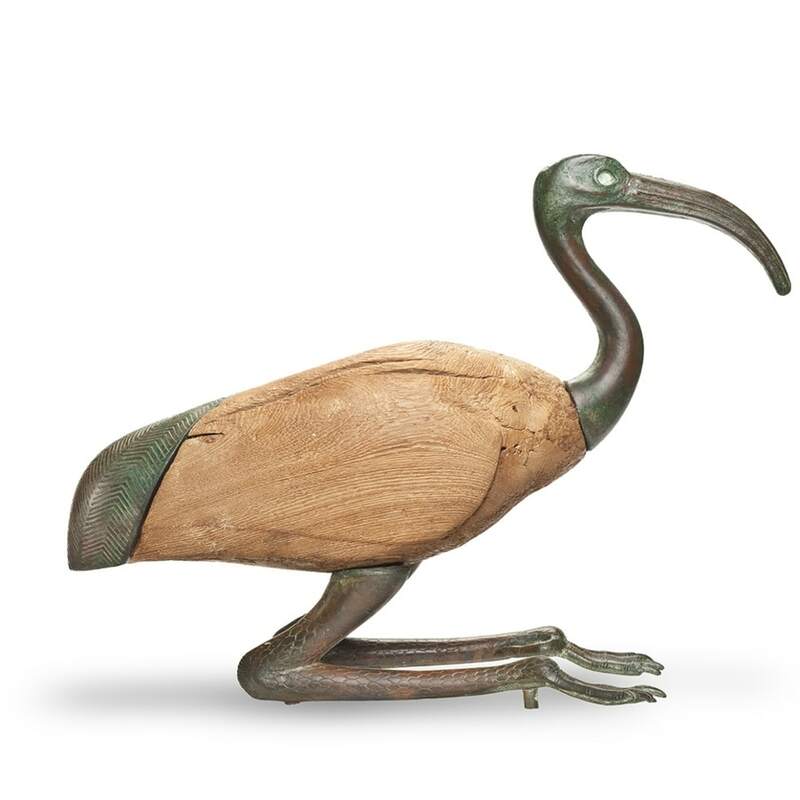 The wooden body may have originally been painted or even sheathed in leaf, sometimes accompanied with the mummified remains of an ibis. 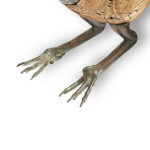 Fixed in to the wood, are a pair of bronze elongated legs that contain minute detail depicting the bird’s scales. 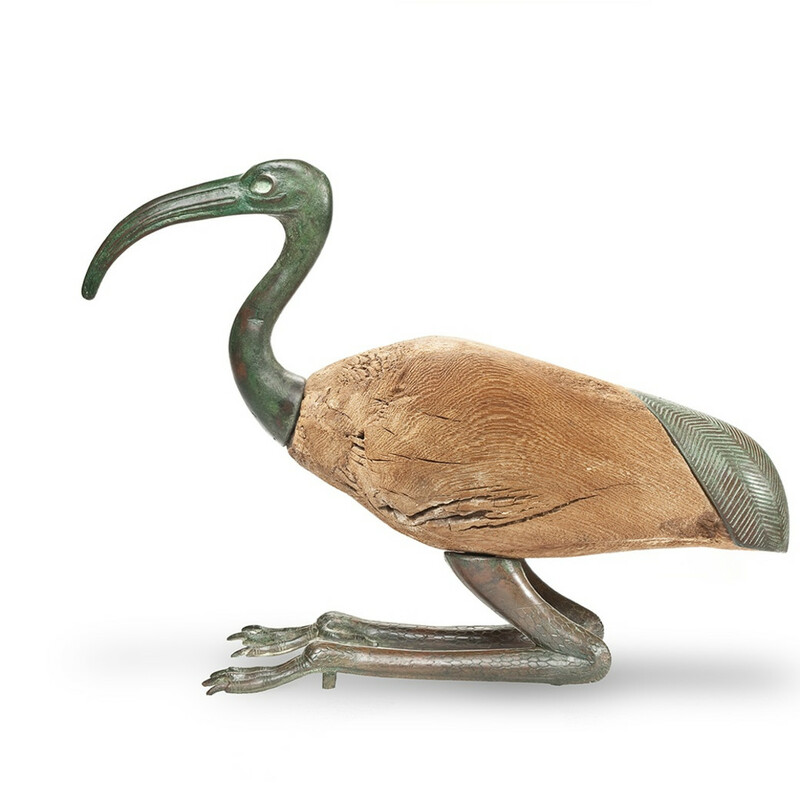 At the rear sits a bronze tail section – a highly rare survival in tact that many extant ibis sculptures are missing. At the front, a long swooping bronze neck extends upwards, leading to a finely detailed and beautifully executed cast bronze head with a drooping beak. The beautiful bird exhibits a calming yet poised force, as it rests on its haunches. To the ancient Egyptians, the ibis was the manifestation of the deity Thoth – the god of wisdom and the inventor of the hieroglyphic system. During the 26th Dynasty his cult was centred in Middle Egypt at the site of Ashumnein, near a complex of catacombs at Tuna el-Gebel. Pious pilgrims dedicated images of Thoth within the catacombs to assist the dead in the afterlife, with their souls being weighed against one of Thoth’s feathers in judgement. Many bronze and wooden ibexes, as well as mummified birds have been found around this complex, and may have been where ours was originally dedicated. 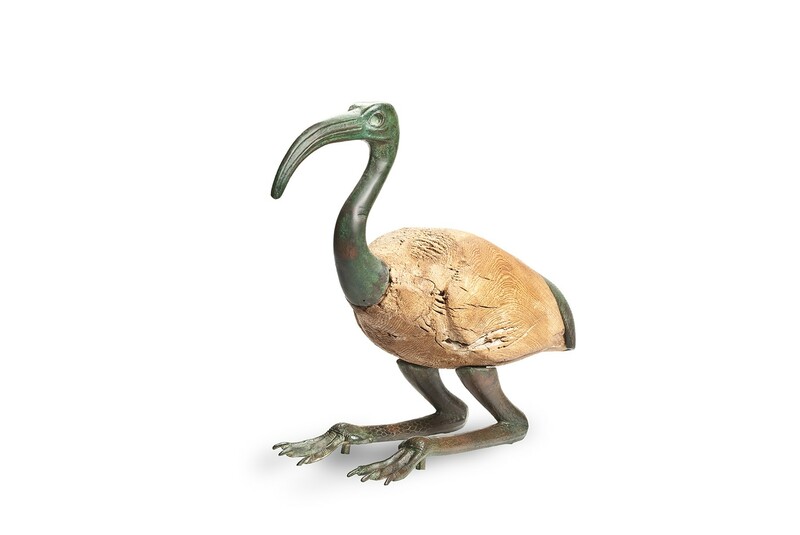 According to the ancient historian Herodotus it was an offence to kill an ibis as the embodiment of Egyptian gnosis, highlighting the reverence with which this statue would have been approached. 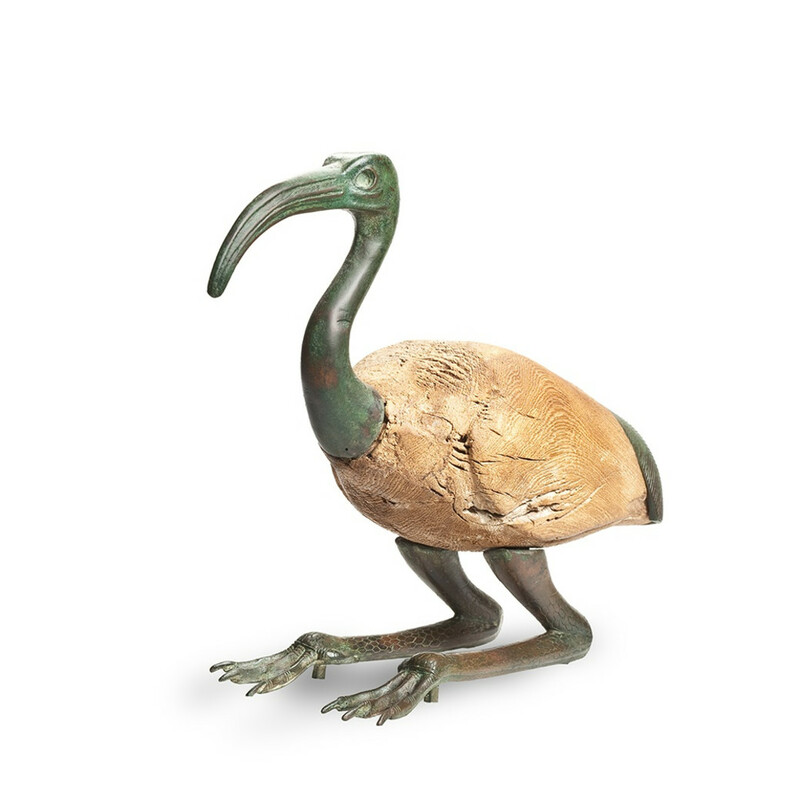 Wonderfully capturing the essence of the ibis, this alluring statue exemplifies Egyptian sculpture and its inventiveness, while highlighting their deep association between zoomorphic gods and their physical presence in craft. 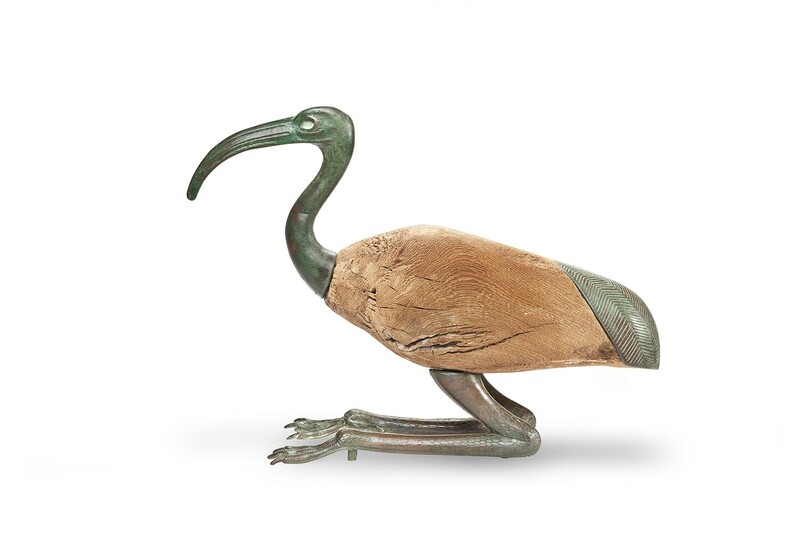 A similar wooden and bronze ibis can be found in the Metropolitan Museum of Art in New York, although surviving in worse condition than ours and missing the tail and feet - highlighting the excellent condition of this example. The body of the Metropolitan museum example contains traces of painted linen, suggesting ours too may have once been similarly decorated, and a glass bead is set in to its eye, as ours may have once had. Similarly dedicated to Thoth at Ashumnein, the two birds combined speak of a rich cultic devotion and very real belief in the mystic power of such statues to the citizens of ancient Egypt. 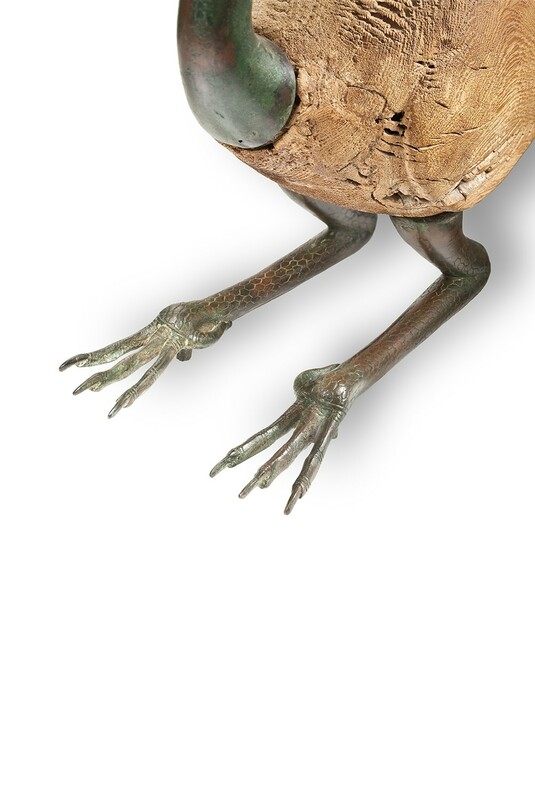 Worthy of any fine museum collection, this stunning statue is full of mystery and would have no doubt once graced the catacombs of a deceased noble person in Ancient Egypt. K.V. der Toom et al. ; Dictionary of Deities and Demons in the Bible, ‪Wm. B. Eerdmans Publishing, 1999, p.444. J.S. Crawford; ‪Ancient Art at the University of Delaware: An Exhibition at the University Gallery, February 12-March 31, 1987, University of Delaware, 1987, p.21. H.B. Werness; Continuum Encyclopedia of Animal Symbolism in World Art, ‪A&C Black, 2006, p.235. Previously in the private collection of Madame Emile Saeed, Acquired in 1970.